The National Plant Biosecurity RD&E Strategy is a component of the National Primary Industries RD&E Framework, an initiative of the Standing Committee on Primary Industries (SCoPI). The aim of the framework is to ensure Australia’s RD&E capacities are aligned nationally with future industry and community needs, to initiate collaboration that strengthens Australia’s position internationally and to ensure that RD&E delivery is both efficient and effective. The purpose of the National Plant Biosecurity RD&E Strategy Implementation Committee is to provide strategic oversight and direction to the implementation of the National Plant Biosecurity RD&E Strategy. 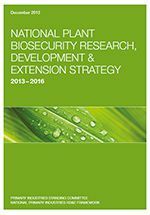 Implementation of the strategy will involve setting up the structures and process by which the biosecurity sector will develop, implement and evaluate Australia’s long-term strategic cross-sector plant biosecurity RD&E needs and priorities, promote and facilitate collaboration and monitor Australia’s RD&E capability. A working space for the National Plant Biosecurity RD&E Strategy Implementation Committee has been established on the Biosecurity Portal.